Need to know where to find the best prices on motorcycle exhaust pipes? The purpose of the motorcycle exhaust pipes (and the rest of the system) is to direct the gases coming out of the combustion chamber away from the machine (and more importantly the rider) to cool the exhaust gases down and (sometimes, but not always) to make them quieter! "The Great Biker Build Off"
There is a classic episode in which Billy Lane is riding one of his creations to a bike show when the ill directed exhaust pipes on his bike cause his pants to catch fire! Priceless! Given that the good old internal combustion engine basically creates a series of little explosions to give us that forward propulsion of our two wheeled babies, its not surprising that exhaust gases are generally very noisy. So that the motorcycle exhaust pipes can comply with noise regulation they need to pass through a muffler, or silencer. the terms are at best a little optimistic (and when you listen to some of the custom choppers, downright misleading!) but they do a pretty good job for all that. The object is to allow the gases to pass down the motorcycle exhaust pipes as freely as possible, while absorbing the surplus energy which we recognise as noise, and occasionally music! Quite often this is achieved by absorption; the gases flowing at speed down the motorcycle exhaust pipes are slowed down by allowing them to expand into the body of the muffler. The noise energy is broken down further by obstructing them with perforated baffles or through an expanded metal mesh and into a pad of mineral wool. By the time the gases are coming out of the slash cuts on the end of your motorcycle exhaust pipes, the noise has been subdued to a reasonable level. The alternative approach is to break down the motorcycle exhaust pipes into smaller compartments so that the exhaust gases are routed backwards and forwards a bit like travelling through a maze. The sound waves are reflected against the walls of the compartments, losing a little bit of their enegy each time, until when they exit the tailpipe the noise is again at an acceptable level. However, whatever your personal taste is in motorcycle exhaust pipes, the most important thing is to remember that whatever you buy must actually fit the size and other specifications mentioned by the manufacturer of the bike! The quality online suppliers will help you make the right choice for your bike, whatever its make and model. The full exhaust system is connected to the head of the engine and the slip-on exhaust connects to the opening where your stock muffler is usually found. If a high end powerful performance is what you are looking for, than a full exhaust system is usually the best bet. This exhaust system suits long distance tourers and motorcyclists who frequently run their machine at close to full throttle. Almost every cruiser is outfitted with a full motorcycle exhaust system to ensure optimum speed, power and control on the road. Recent regulations on emissions have affected the factory set up and reduced the power ouput of factory bikes somewhat; this can be overcome in some cases with a slip on system. The slip on exhaust system is normally associated with street bikes where owners can get a little hung up on the power putput of their bikes. 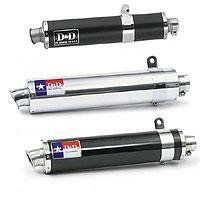 The benefit of using a slip on motorcycle exhaust system is that it gives your bike what is called "low end" power. This allows you to squeeze a little more acceleration from the bike. Once you have decided on which motorcycle exhaust pipes are best for you, there are potentialy three extra components you should consider adding to your installation package. These additional motorcycle parts prevent stains, engine damage and undesirable performance. Install a fuel management system along with your new motorcycle exhaust system. This allows the airflow and fuel in your pipes to be optimised so that your bike runs smoothly.don't forget what I said about the factory set up of most bikes these days; they are on a knife edge interms of meeting emissions regulations, and if you change the exhaust, you almost always will change this set up without realising it,. A fuel management system also prevents hotspots ocurring within your exhaust and so stop it deteriorating and turning a brilliant blue. (yep you guessed it thats what "bluing" is) If your bike is fuel injected, you will need to install a type of fuel management system called a power commander. If your bike has a carburetor you will need to install a fuel management system called the jet kit. I'll go into these in more detail in another article. Install new exhaust gaskets every time you replace the motorcycle's exhaust system. This prevents your exhaust from leaking and damaging the engine. If you are changing your exhaust in any way, why skimp on what is probably the cheapest and easiest part of the job? Replace your air cleaner as air or more accurately oxygen is one of the keys to getting more power out of your bike. This also allows for the optimum chemical reactions to take place in your exhaust so your bike can run at optimum efficiency. Never forget that you power comes from combustion. To make that fuel burn, you need oxygen, so efficient air intake is an important part of a smooth running exhaust. Chreck out these online stores for all the accessories you need for a new motorcycle exhaust system! 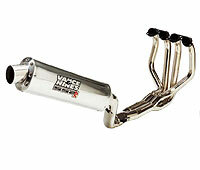 Motorcycle Superstore has a great range of exhausts, all the leading makes are represented.